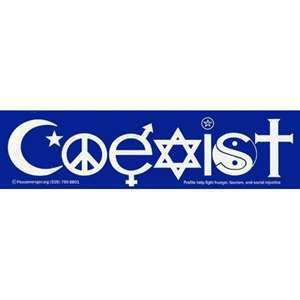 Most of us have followed a car bearing the bumper sticker: Coexist. Symbols of different religions make up each letter of the word. Sounds good. In order to “give peace a chance,” shouldn’t we all “coexist?” But, what does this mean? Not everyone in my circle of family, friends or neighbors believes exactly as I do. Therefore, I “coexist” with people of many perspectives on life and of many faiths by treating them as the human beings God made them to be. They are worthy, because of what Jesus Christ has done for us all, of my kindness. Respect. Civility. Care. Concern. Help. At every Titus 2 Retreat, I share the passage from Ezra 4:3. It is a powerful message for Christians living in this “progressive” age. The Israelites had been captive in Babylon for a long, long time. When the Babylonian king told the Israelites they could return to their homeland, very few of God’s people chose to do so. They had coexisted with the Babylonian religions and practices for so long that they didn’t want to return to their “old ways.” A relatively small number of Israelites returned to re-build the decayed city of Jerusalem. With such few workers, the re-building of Jerusalem was difficult. Watching the process, some non-believing neighbors in the land offered their assistance. (Did they have an agenda of their own?) But, God cautioned His people not to accept the help of unbelievers. Why? 1) The job of rebuilding Jerusalem was given exclusively to God’s people, 2) accepting help from non-believers would obligate God’s people to pagan ways, and 3) the potential for corruption in worship was too great if God’s people aligned themselves with non-believers. Can people who call upon the name of the Lord Jesus Christ coexist with those who do not? As kind and civil human beings who see each of their neighbors as creations of God: Yes. But, as believers in the One True God who reveals Himself in three persons: Father, Son, and Holy Spirit: No. We cannot “coexist” if the definition is “blend,” “bend,” or “bow to other gods.” The Biblical worldview of male and female, children and family, education, human care, law, government, and even economics contrasts all others.